This bio was originally on the older Sounds From Source Website - check further below for the biography that used to be housed on the Academy site as well. 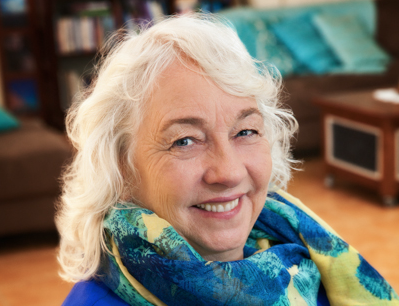 Spiritual facilitator,vibrational and spiritual kinesiologist, teacher, author, poet and great-grandmother, Reverend Sheila Kennedy is a protagonist for social change : from the deep recesses of cellular memory to the vast expanses of the universe. A woman of Celtic and Spanish Gypsy ancestry, Sheila grew up in East Africa and the Australian outback. Sheila's work, like her background, is an eclectic and innovative blend of indigenous and contemporary healing modalities. Vibrational Kinesiology [The Dawson Program], Reiki/Seichem/ Atlantean Reiki, Spiritual/ Aura Healing, Chakra Balancing, Self Empowerment and Regression Therapies, Holographic Kinetics, Hypnosis, The Children’s Learning Program and Vibrational Sound Therapy. In 2004 Sheila co-created The Sounds from Source. 'The Sounds' are a synergistic blend of channelled information, the sound and vibration of tingshaw bells and, the power of intent. The sounds facilitate the release of cellular memory and assist in restoring the body to health and harmony. In more recent times, the sounds have evolved to facilitate planetary and universal healing. Similarly, Sheila's energy has evolved to support the healing of Mother Earth and broader expanses. Sheila is currently completing a PhD in Metaphysics. She is the founder of The Children’s Learning Program, The Sounds from Source Practitioner Programs, Energetic Balance and Harmony Program, the Sounds from Source Academy and Vibrational Sound programs. Healer, teacher and great-grandmother, Reverend Sheila Kennedy is a protagonist for social change : from the deep recesses of cellular memory to the vast expanses of the universe. Sheila's journey into holistic healing practices began 30 years ago, traversing a range of modalities including: Vibrational Kinesiology [The Dawson Program], Reiki/Seichem, Spiritual/ Aura Healing, Chakra Balancing, Self Empowerment and Regression Therapies, Holographic Kinetics, Hypnosis, The Children’s Learning Program and Vibrational Sound Therapy. The sounds facilitate the release of cellular memory and assist in restoring the body to health and harmony. In more recent times, the sounds have evolved to facilitate planetary and universal healing. Similarly, Sheila's energy has evolved to support the healing of Mother Earth and broader expanses. In the mammoth task of putting together the Sounds from Source Academy site ready for its launch Susan asked me to write some thing about the Sounds from Source. Where do I start? The beginning I suppose is as good a place as any to begin, although it would almost be easier to go back down through time. I have always been attracted to sound, music if you will. My father played a number of instruments one of my favourites being the Piano Accordion. Growing up in East Africa I went to sleep most nights to the sound of the drums, a resonance I love to this day. When I met Cameron Dawson in 2002 and he introduced me to Vibrational Kinesiology and the amazing range of ancient instruments he used I was already familiar with some of them, I had been using American Indian Drums, Tibetan Tingshaw bells, and Crystal Bowls in my healing practice for some time. Later whilst working with Cameron I began to use a specific set of bells in my work which I had been gifted some time earlier. Cameron was fascinated with them and offered to purchase them from me on a number of occasions. Following Cameron’s passing in 2004, I began to introduce my own work into the methods he had taught me, and I soon discovered my own ways of clearing or alleviating issues for my clients that just worked. The origins of the Sounds from Source program itself owe their being to two things, my awareness that many of my clients suffered from what I referred to as ‘anxiety’, and my own severe allergies which had plagued me for much of my life. I had created a set of sounds to relieve the deep seated cellular anxiety and decided to expand on them to create a sound to see if I could remove the memories of the allergies and their reactions from my body. The rest is history, I am now allergy free, and have been from that very first ringing of the bells which are known as “Genetic Memory’ sounds. Originally I referred to the Sounds as 'The Healing Sounds' for to me that is what they were, Sounds which healed, or which facilitated the body ‘healing’ itself, and it was Susan who pressed me [a gentle terminology] to ‘do something ‘ with them so that they could be shared with other people. When we were gifted the Sounds we were surprised and amazed at the levels that they worked on and the levels of cellular memory that they worked to, and a gift they were. Many of them came about through requests from other people both clients, and friends. As the sounds grew in number and in complexity so did we. Often we were challenged or in chaos as a new sound presented itself, no easy task was this, it could at times literally take over our lives. I have some times expressed to Susan a feeling of ‘not being well’ nothing specific just not well, these were some of our many and lengthy sessions on the telephone or the computer. Susan would in her own words ‘rub her hands in glee’ as these were the times that I worked at my best, often with information coming through in a rapid fire fashion, and Susan writing as I spoke, we had at that stage no knowledge of where the information we were given came from, just that it was of a high spiritual nature. Over time we questioned, accepted and questioned again, why us, why were we chosen for this task? How many sounds could there be, and still the messages came. Our lives changed, as we changed. The Sounds gave yet they took also, looking back they removed those things which were not of benefit in my life at the time, people, relationships, and possessions. Our belief in the sounds and the body of intelligence which shared them with us grew. We began to have more and more insights as to how the sounds worked and why. We were very aware when the original series of the sounds changed and became deeper and more specific in their information, and from then there have been many changes. Changes in Susan and I, changes in the sounds as they grew in their depth of purpose and the sense of completeness for want of a better word. Recently the sounds have changed again, not once but twice in a short space of time covering aspects and levels we never dreamed of, creating changes within us and allowing us to take our knowledge and work to, I believe, the next level, and the levels beyond that. We also became more aware that people will derive whatever it is that they are personally willing to acknowledge, accept, and allow from the Sounds and their healing frequencies, does indeed the kindergarten child understand university math? The physical, mental, spiritual and emotional levels of the body will absorb what they need for the individual healing of each person. Often I have described to clients that what they experience when they listen to a sound or sounds does not just resonate at the time, the memory and the vibration and the resonance of the sounds remain deep within the cells of the body for some time to come, and that the effects will often will be ‘picked up’ by other people that they are with, often long after they have heard them. Recording the Sounds has been a challenge in its own right, there have been a number of wonderful people who have assisted in this process, and many a very long session to complete the required number of recordings. Our logo, created lovingly by sister and brother team Lilian and Andrew Cunningham also reflects the purity of the Sounds and their resonant frequencies. It a little different now from the original, due to our change of name yet equally as special and precious to us. As the Sounds grew so did our need to have a web site to share them with the world. Susan willingly took on this mammoth task, learning as she went, and still the sounds came, when we reached more than one hundred, I thought that we were nearly at the end, and yet they continued to come. The newer sounds have more depth to them and work with areas we never knew existed. The writing of the protocols of words as we call them took longer as they became not just pages but many pages long. Recording some of these very long sounds has been an enormous task, the sheer pressure of holding the leather string which joins the Tingshaw bells for twenty to twenty five minutes carves deep grooves into my fingers, and there is a sense of relief when I can finally put them down. Often as I record the tears stream, a little disconcerting for the recording engineer who is facing me from the other side of the glass, Susan is quite used to this and has boxes of tissues close at hand. Why do I cry, I really can’t explain, I often realise that the tears are not my own, I am just the conduit. Our original web site became a number of sites as we expanded our ideas to incorporate the new information into different programs. The Sounds from Source Academy site. All thanks to Susan’s expertise and the invaluable help of her family. I hope that you gain as much benefit from The Sounds from Source Academy site as we have benefited in its creation. Please enjoy The Sounds From Source - they have been sent to assist you - if you will allow it. NB: Of course now Sounds From Source and the Academy site are amalgamated into on 'super site'.